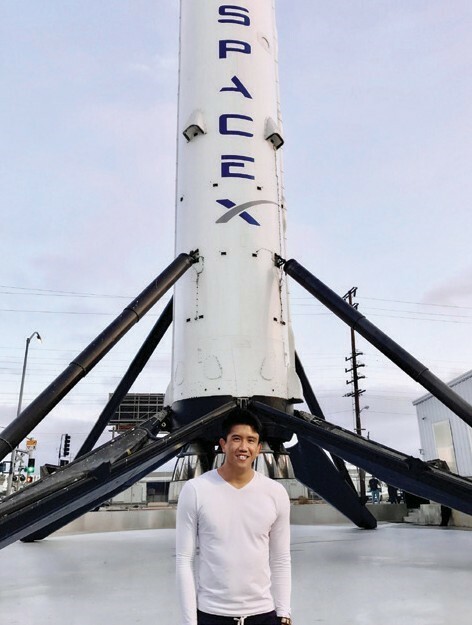 For the past two summers, Daniel Kurniawan, an ISyE senior, has had what might possibly be considered one of the coolest internships an industrial engineering student could have: He worked for SpaceX, the company founded by entrepreneur Elon Musk (also of Tesla fame), with the ultimate goal of sending people to live on other planets. As a high school senior, Kurniawan — who is originally from Maryland — visited Georgia Tech two days before his college decision was due. After his official campus tour, he and his family went to an Indonesian restaurant on Atlanta’s Buford Highway. It was there that he happened to meet Moorissa Tjokro (BSIE 14), an ISyE student who was about to graduate a few days later. As it turned out, Tjokro was a family friend from the Indonesian city where Kurniawan’s family originates. Kurniawan has taken this attitude and perspective on leadership to his internships at SpaceX, where he has worked to develop a proof-of-concept for machine learning. In December 2017, he’ll join the company as a full-time employee after he graduates from Tech (in fewer than four years, in fact). And in addition to working for SpaceX, he’ll continue traveling the world. He has visited six continents and plans to check off the seventh — Antarctica — within the next few years. For the last couple of years, you’ve been interested in data science and machine learning. What appeals to you so much about these fields? There are infinite amounts of ways that you can solve machine-learning problems. At its heart, machine learning is simply teaching computers to learn. The idea is to use algorithms to decipher other patterns and correlations in a data set. What I like so much about machine learning is that each problem has a different solution. I have never come across a situation where I’ve solved two problems the same exact way. Each problem requires in-depth analysis to understand what the data is saying, and as a result I found that even the most similar problems may have completely different approaches. Another thing I like about machine learning is that nowadays I see applications of it everywhere. “Discover Weekly” on Spotify is essentially a recommender system that uses collaborative filtering to recommend a list of songs you may like based on similar user behavior. When you Google something, PageRank is used to rank websites in the search engine based on relevance and importance of sites. Facebook uses image detection to predict who is pictured in an uploaded photo. These are all examples of how machine learning is used in our everyday lives. Interning for SpaceX is outside the typical ISyE industry or company. What led to your initial internship at SpaceX last year? I happened to pass by SpaceX at their career fair booth while looking for my first internship my sophomore year. I quickly learned that this wasn’t a typical corporate job: SpaceX has big plans to reinvent space access, satellite telecommunications, and colonize Mars. I knew I would be working long hours, challenged with new problems, and faced with tight deadlines. I was sold knowing what kind of pressure and responsibility I would have in changing the future of humanity. In the summer of 2016, I met Justin Hey (BSIE 16), a fellow ISyE student, and roomed with three other Georgia Tech interns. Georgia Tech is actually a primary target school for SpaceX recruiting. What did you do in your first SpaceX internship, and how was your internship this past summer different? Last year I worked in data analytics to support our production planning team. That role mainly involved mining and analyzing data to develop a strategy for outsourcing parts. In 2017, I took the lead in creating machine-learning applications for the business, which had me doing significantly more software development than last year. At SpaceX, no matter what department you’re in, you’re part of the mission for getting to Mars and rocket reusability. Everything you do directly affects the rocket. This year’s project focused on meeting launch deadlines and ensuring that the rockets are safe. My project looked at potential problems — the rocket or the launch going wrong — and tried to resolve these before the launch. Machine learning in my department is very new — it was just myself and one other person — and we were pioneers trying to show use-value in its applications. What unique perspective did you have to offer as an ISyE student in these internships? As a machine-learning engineer with an ISyE background, the perspective that I had to offer is the ability to code, as well as an understanding of the manufacturing process. Since SpaceX is a rocket manufacturing company, it makes it easier for me to understand business requirements and translate those into applications due to ISyE’s strong emphasis on manufacturing. Have you been to the launch facility? I have not been to SpaceX’s launch sites at Cape Canaveral, Florida, and Vandenberg Air Force Base in California. However, mission control is located at the headquarters in Hawthorne, California, so on launch days everyone goes downstairs to see and hear the launch as it's happening. Everyone watching outside mission control erupts into cheers after every checkpoint in the launch sequence. My favorite part is when the first stage of the rocket lands back on Earth! You’ll graduate at the end of the fall 2017 semester, and you plan to return to SpaceX in a full-time capacity. What will you be doing? I’ll be coming back as a machine-learning engineer. Some of the projects I may be working on include image classification, natural language processing, recommendation engines, ranking systems, anomaly detection, and various other learning techniques. It’s all part of the process to help us get to Mars. What advice do you have for ISyE students who might want to strike out on an atypical college or career path as you have done? Find something you’re passionate about and commit to it. I’ve found that it is so much easier to do your job well when you love what you do. ISyE at its heart is a problem-solving major, and because it’s so broad, there are many different areas to which we can apply that mindset. The trick is finding what area you want to focus on and equipping yourself with the knowledge and resources to be successful in that field — a step that becomes so much easier when you have the passion and drive for a particular subject.